Starting with only high quality fiber, we make a consistent, high quality wood pellet that customers have been heating their home with for years. We are committed to finding only the best raw materials and continually finding ways to improve our product. Available in 40 lb bags, 50 bags per pallet. Each ton of pellets is shipped with 2 individual pallet covers (2mil inner and 4mil. outer) to offer the most protection from environmental moisture. Be sure to protect your pellets from the environment. For more benefits of burning pellets see this page at the Pellet Fuels Institute. To compare fuel costs with pellets and other fuels see this Comparison Chart. North Idaho Energy Log’s Super Premium Pellets are a proven clean renewable heat source. With it’s extremely low emissions and extremely high BTU, it provides a clean, low ash fire with little or no residue. Meaning it is a safe, clean, affordable, environmentally friendly alternative to other fuels. 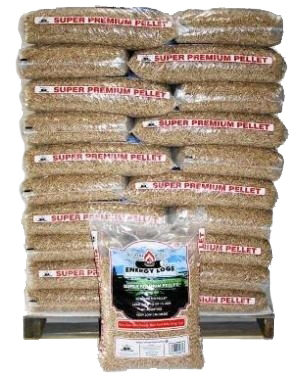 Super Premium Pellets are Available in 40 lb bags, 50 bags per pallet. Easily store a years supply in 1/3 of the space used for firewood.